The District has been involved in collaborative research programs concerning the biology, ecology, and control of midges since the early 1960’s. Collaborative research concluded that physical control, the ability to manage the movement of water to and from midge habitats, is the most effective method for preventing midge occurrence. This method properly disrupts the midge life cycle, preventing adult emergence. Larvicide use becomes unnecessary or minimal and service requests remain infrequent. In 1998, after years of responding to midge complaints, the District began a proactive midge control program aimed at preventing adult midge emergence. The basis of the program is to maximize physical control and minimize the use of larvicides. In order to achieve this goal, the District has established a cooperative relationship with the Los Angeles County Department of Public Works, which is the agency that controls the water sources responsible for creating midge habitat. Do you have a midge problem? We can help. Midges are non-biting flies that resemble mosquitoes in size and general appearance. They are considered nuisances and are one of the vectors that are controlled by our specialized staff. Midges are approximately a half-inch in length and light green to brown in color. Midges are usually a problem from April to September and survive the winter as larvae in mud and at the water bottom. Swarms typically emerge at sunset. Midges are especially bothersome for residents near flood control channels, ponds, reservoirs and spreading basins. Residents near these areas may find midges around cars, screen doors, windows, walls and entryways. May create stressful living conditions for nearby residents by hampering outdoor activities such as jogging, barbequing, etc. around dusk. They are attracted to outdoor lights located approximately within a quarter mile of their breeding sources and may enter homes. Flying adults can become stuck on newly painted surfaces. Adults can deface walls, ceiling, curtains, and other property. Swarms can cause discomfort or irritation by entering the eyes, ears, nose, and mouth. These insects do not constitute a public health problem because they do not transmit diseases. Several species, however, have been documented as the cause of allergies in people exposed to massive swarms. In residential areas, they tend to lessen real estate value. In industrial situations, they interfere with processing of food, paper products, plastic, and automotive refinishing operations. 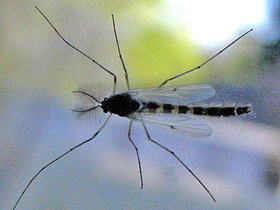 These midges develop and breed in aquatic habitats similar to mosquitoes. Eggs are laid in a jelly-like mass on water or in the mud. Newly hatched from eggs, the larvae burrow into mud. The larvae are often bright red and live in water or wet soil, where they feed upon organic matter, particularly algae. The pupae rise to the water surface after the final larval stage and soon emerge as winged adults. Adults will live approximately 7 days depending upon the species and weather conditions. Males form swarms where they capture females for mating. Is a midge a mosquito? the bottom of lakes, ponds, etc. Delay turning lights on as long as possible after sunset. Keep doors closed and windows tightly screened to prevent midges from entering the home. Avoid using zap traps or other electrical traps, which are virtually ineffective.